Congratulations to Kerisha for receiving a Spring 2019 Graduate RISE scholarship. Well done!!! Welcome to the group, Justin Mitchell and Praveen Ravishankar. We are welcoming Dr. Carl Morandi to the SMART Lab, as a new postdoctoral fellow. Carl is joining us after obtaining his MS and PhD from Penn State. Welcome to Hotlanta, Carl, although it has been really cold this week. Congratulations to Lee ​for winning a 2019 STAMI Graduate Student Fellowship. Well done! Prof. Bassiri-Gharb delivers an invited talk at the MRS Fall 2018 meeting in Boston on Careers in Academia. You can find a copy of the presentation under the Teaching tab. Prof. Bassiri-Gharb presents a keynote talk at the iWOE (International Workshop on Functional Oxides), in Les Diablerets, Switzerland. Welcome to the group, Kerisha Williams. And welcome back to the group, Melissa. This time you are a true Yellow Jacket! Many congratulations to Yulian for receiving a Jewell Family Fellowship. Well done! Prof. Bassiri-Gharb discusses SMART Lab's work at the Applied Physics seminar at UGA, Athens, GA.
SMART Lab and Prof. Bassiri-Gharb are featured in The Institute, discussing our current research on smart materials, and how to make a career move to smart materials. Prof. Bassiri-Gharb presents an overview of SMART Lab's work at the IEEE IFCS in Squaw Valley, CA and IEEE ISAF (IFAAP2018) in Hiroshima, Japan. Congratulations to Evelyn for winning the 3rd place award for the Student Poster Competition in MSE' Energy Materials division. Congratulations to Evelyn for winning an Executive Vice President for Research Award at the Career, Research, and Innovation Development Conference. Congratulations to Evelyn, Yulian and Lee for winning travel awards from IEEE IFAAP 2018 and NSF to attend the IEEE International Symposium on Applications of Ferroelectrics in Hiroshima this May. Congratulations to our HS students, Melissa for getting Early Action admission to Georgia Tech, and Grace to Georgia Tech and Princeton for next Fall. We all sure hope to see you around next year! Welcome to SMART Lab, Micah and Valeria. Congratulations to Sam for winning a Presidential Undergraduate Research Award (PURA) for Spring 2018. Prof. Bassiri-Gharb is the Women in Engineering Breakfast speaker at the IEEE Energy Conversion Congress and Expo North America (ECCE-NA). Congratulations to Caroline for successfully defending her master's dissertation. Georgia Tech's College of Engineering ranks at #4 in the U.S., as reported by U.S. News & World Report. The Mechanical Engineering program is ranked at #3, and the Materials Science and Engineering at #5! Together we storm! Congratulations to Dr. Steven Brewer for a successful defense of his doctoral dissertation work. Wish you all the best at Apple and hope to have you back among our ranks at some point in the future. Welcome to SMART Lab, Mohammed. Congratulations to Prof. Bassiri-Gharb for being selected as a Woodruff Faculty Fellow. Congratulations to Dr. Jilai Ding, for successfully passing all the Doctoral requirements. Wish you all the best in your adventures in Silicon Valley! Congratulations to Evelyn Chin and Yulian Yao for successfully passing their Ph.D. qualifier exam! Excellent job, ladies. Congratulation to Steve for winning the Silver Medal at the Student Poster Competition at the 2017 Joint IEEE ISAF-IWATMD-PFM. Prof. Bassiri-Gharb and SMART Lab host the 2017 Joint IEEE International Symposium on Applications of Ferroelectrics (ISAF), the International Workshop on Acoustic Transduction Materials and Devices (IWATMD), and the Piezoresponse Force Microscopy and Polar Phenomena at the Nanoscale Workshop (PFM) at Georgia Tech, May 7-11, 2017. Congratulation to SMART Lab alumna Myela Paige for winning an NSF Graduate Student Fellowship. Myela is currently a PhD student in Mechanical Engineering at Georgia Tech. Congratulations to Lee on successfully passing his Qualifier exam. Prof. Bassiri-Gharb gave an invited talk at the International Symposium on Ferroic Domains (ISFD13), in Vancouver, Canada. Prof. Bassiri-Gharb joins the Advisory Board of International Symposium on Ferroic Domains. ​Welcome to the group, Yulian Yao! Welcome to the group, Lee Griffin! Welcome to the group, Evelyn Chin! Congratulations to Carmen and Connor on passing successfully their Qualifier exam! Congratulations to the SMART Lab alumna, Sara Fridovich-Keil on being awarded a 2016 Goldwater Scholarship. The Scholarship—the most prestigious undergraduate award given in the sciences—is awarded to about 300 college sophomores and juniors nationwide. Many congrats! Congratulations to Carmen for receiving Honorable Mention for her NSF GRFP application. Congratulations to Kenzie, for making it to the State Science Fair for her summer science project with SMART Lab. Carmen, Connor and Steve visit the Center for Nanophase Material Sciences at Oak Ridge National Lab, for advanced microscopy characterization of materials and processing of new samples. Prof. Bassiri-Gharb, Steve and collaborators attend the GOMACTech annual meeting in Orlando, FL. Steve presented a poster as a student poster finalist, and Prof. Bassiri-Gharb gave an overview of the team's recent work on ionization effects of gamma radiation in ferroelectric thin films. Our paper in Advanced Functional Materials is the Top Story on NSF360 and DOE Office of Science's frontage. And on the inside front cover of Advanced Functional Materials. Our paper in Journal of Applied Physics tops the list of the Editor's Pick for Journal of Applied Physics. Jilai, Steve and Prof. Bassiri-Gharb attend the American Ceramic Society's Electronic Materials and Applications in Orlando to present their work. Jilai and Steve make it to the Student Speaker Contest finalists list. Congratulations to Steve for being awarded the third place in the Student Speaker Contest at the ACerS' EMA meeting. Well done, Steve! Congratulations to Sang for winning a​ Air Products ME Undergraduate Research Award for Spring 2015. Well done! Congratulation to Dr. Bassiri-Gharb for becoming the new President-Elect for IEEE Ultrasonics, Ferroelectric and Frequency Control Society (UFFC-S). 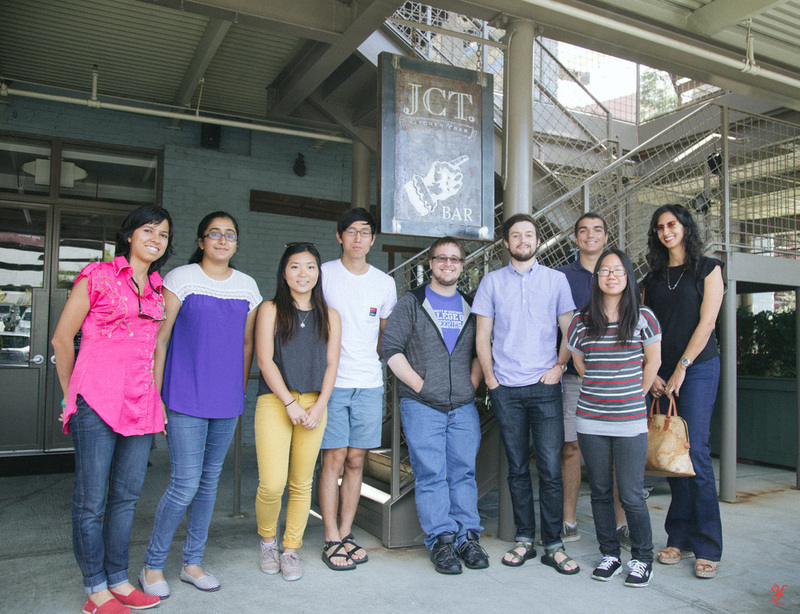 The group gather to share a luncheon at JCT. Steven and Aida Yoguely work diligently on the processing of new thin films. Meanwhile, Connor attends a cleanroom training session. Welcome to the group, Carmen Deng and Caroline Park! Welcome to the group, Connor Callaway! Congratulations to Aida Yoguely for receiving Honorable Mention at the Air Products Undergraduate Poster Symposium and Competition. Well done! A warm welcome to principal investigators from NCSU, ARL, and NRL attending the DTRA Kickoff meeting and touring the SMARTLab facilities. Congratulations to Steve for successfully passing his PhD Qualifier exams in Mechanical Engineering. Congratulations to Aida Yoguely for competing in the NASA Humans in Space Art Video Challenge and winning 1st Place in the Live Action category and an Honorable Mention Overall! Watch the award winning video #We Need Space! Welcome to Sang Yun Han, ME undergraduate student at Georgia Tech. Sang will be working on the processing of complex oxide thin films. High School Students toured the SMARTLab facilities as part of the Women in Engineering (WIE) Exploring Engineering event! Thank you Steven Brewer, Ayesha Asif, and Aida Yoguely for showing them around. Congratulations to Jilai for the GO Fellowship at Oak Ridge National Laboratory. We are sure you will do great. Welcome to Ayesha Saif, MSE undergraduate student at Georgia Tech. Ayesha will be tackling some fundamental problems of switching in ferroelectric materials. Congratulations to Aida Yoguely who has won the Air Products ME Undergraduate Researcher Award! 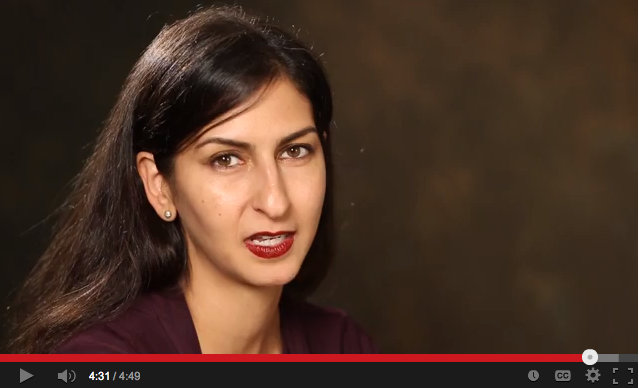 Check out Aida's cool video on why we need Space. Very proud of you! Dr. Bassiri-Gharb presents a Doctoral Program Short Course (25hr of lectures and lab) on Ferroelectric Materials: from Fundamental Principles to Applications" for the Doctoral Program in Materials And Nanostructures Science and Engineering at University' degli Studi di Padova (Padua, Italy). Congratulations to Steve for receiving the Gold Award and to Jilai for placing as a finalist at the 2014 CNMS User Meeting student poster competition. Great job guys! Read about Dr. Bassiri-Gharb's recent sabbatical at the Oak Ridge National Laboratory here. Dr. Bassiri-Gharb is at Georgia Tech France (Metz) for the Fall 2014 semester. Welcome back Aida Yoguely from your summer NASA Fellowship. Steve and Jilai spend a week at CNMS, processing samples and collecting data. Dr. Bassiri-Gharb gives an invited talk at the Materials Horizons' symposium in Atlanta. Dr. Bassiri-Gharb attends the 2014 NUFO Exhibition for the US House of Representatives in Washington D.C.: visits with Georgia senators and congressional representatives. Let's showcase some awesome science! Dr. Bassiri-Gharb joins the Editorial Board of Scientific Reports for Condensed Matter Physics. Dr. Bassiri-Gharb, Jilai and Steve attend the IEEE ISAF/IWATMD/PFM Workshop in State College, PA. Great job, Steve and Jilai, giving your oral presentations. Aida Yoguely presents her work at the 9th Undergraduate Research Spring Symposium and Awards at Georgia Tech. Congratulations to Aida Yoguely for winning Second Prize at the Air Products Undergraduate Research Symposium poster competition. It is official: there is a tenured, associate professor in the group! Jilai and Steve are again at CNMS collecting data on samples. Aida Yoguely, Steve, Jilai and Dr. Bassiri-Gharb attend the ACerS' EMA meeting. Congratulations to Jilai for being selected as a semifinalist for the best student presentation. Dr. Bassiri-Gharb joins Center for Nanophase Materials Science at Oak Ridge National Laboratory with a Joint Faculty Appointment. Watch a video about it here. Yes, the semester is over! Jilai, Talia and Steve are spending some fun time at CNMS characterizing their samples and collecting data. Congratulations to Aida Yoguely for receiving a Presidential Undergraduate Research Award (PURA) for Spring 2014. Well done, Aida! Jilai and Aida Yoguely present their work at the MSE Industry day. Talia, Jilai and Dr. Bassiri-Gharb spend a week at the Center for Nanophase Materials Science probing the local electromechanical response of nanostructured ferroelectrics, and electrochemical response of mixed electronic-ionic conductors. Steven Brewer (Ph.D. student, ME) joins SMART Lab. Welcome Steve. Dr. Bassiri-Gharb present an overview of the group's work at the Oak ridge National Laboratory's 2013 Neutron and Nano Workshops and User Meetings. Aida Yoguely's poster places second place overall in NASA's summer interns expo at the Marshall Space Flight Center. Dr. Bassiri-Gharb receives the IEEE UFFC Ferroelectrics Young Investigator Award at the UFFC Joint meeting in Prague. Welcome to Tiany Zeng from Tsinghua University, who is joining the group for two short term research internships. Congratulations to Jilai for passing the Qualifier exams on first attempt. Well done Jilai! Talia is at CNMS, Oak Ridge National Lab, working on characterization of ferroelectric and relaxor-ferroelectric nanotubes with variable composition. Congratulations to Aida Yoguely and Asia Wilson on their first peer-reviewed journal paper. Congratulations to Safoura on successfully defending her doctoral degree. Welcome to Eli Brand and Myela Paige, two of our summer undergraduate researchers. Eli is an UG at GT, while Myela is a visiting SURF fellow. Congratulations to Sina for successfully defending his MS thesis. Talia spends time at APS, Argonne National Lab, performing X-Ray diffraction experiments on ferroelectric thin films. Talia receives an NSF Graduate Fellowship award. Congratulations Talia! Talia and Jilai spend a week at Oak Ridge National Labs performing neutron reflectometry and scanning probe microscopy experiments. Dr. Bassiri-Gharb receives the NSF CAREER award from DMR, Ceramics program. Aida Yoguely is back from a semester at GTL and summer at NASA's Goddard Space Flight Center. Welcome back Aida! Jilai Ding (Ph.D. student, MSE) and Talia Field (Ph.D. student ME) join SMART Lab.